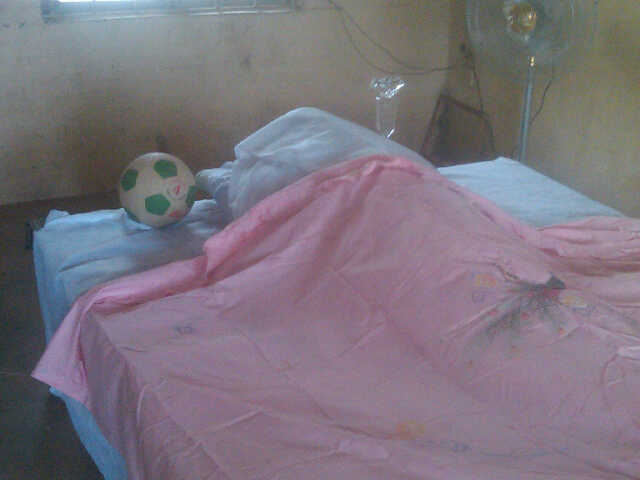 Nigerian Football legend, Rashidi Yekini was laid to rest on Saturday May 5, 2012, a day after his passing. Dignitaries from the Nigerian Football Federation, the Oyo State sports commision, his wife Adeola Yekini, and his daughter Yemi Yekini were present at his graveside as final words were said over his grave and he was laid to rest in Kwara State around 4pm last evening. Several pledges of funds were made to his family, from the Oyo , Osun (N1 million each) and Kwara (N1.5 million) state governments. Yekini’s reknown as the as of yet unsurpassed top goal scorer on the international football team propelled him to the upper echelons of Nigerian celebrity. Yet he seemed to have spent the last few years of his life in obscurity, dealing with bouts mental illness and was said to sufffer from bipolar disorder and depression, and it seems he did not have the financial resources to get the assistance he needed to manage his illnesses. Instead he was spotted wandering the streets of Ibadan, sometimes barefoot. In the end, the neglected king of goals, was finally remembered—for his passion, his pride and his genuine love of the game.